« Roman Abramovich and Michel Platini. Who is kidding whom? Untold Arsenal has always been one of those blogs that is very open to the thought that games can be bought in some way, either by buying some player(s) or is it by buying a ref. Why a player or a ref is bought for is something we don’t know yet. I know of a few local cases in my country of such things but there is no general line to draw on this. It can have all kind of reasons but most of the time money is the one that comes back in all cases. Maybe not as the main reason because some personal preferences can be involved also and then the money is less important but still nice as some kind of risk coverage. So when I saw what happened in the Newcastle-Arsenal game I instantly knew something was wrong. I cannot prove anything or tell the reason why Dowd felt it necessary to do what he did but if you want a classic example of a ref that is not following the rules and the instruction and only is doing this in favour of one team than this is a case study to examine for all and everyone who wants to have a closer look at how a ref performance can turn a game upside down. But this was clear to see that the ref was acting in a very suspicious way in this game. Now I know a lot of people don’t want to know about such things. And then they ask us to come up with some evidence. Now we are just part time writers on a blog and we don’t have any possibility to run our own investigations. We cannot do phone tapping, we cannot follow people. I think if we would do such things we would be in serious troubles ourselves – as the Murdoch empire that runs the News of the World and other newspapers is now finding out. But what we can do is look at some things that have been exposed on this website. The ref predictions from Dogface that were spot on. My own ref reviews and the fact that from the numbers it showed that there is something rotten in the state of Refland. Something we will explore more from next season on if all goes as planned. And when we keep those things in mind and look at the rest of the world we can see that there is something very rotten in a lot of parts in the world. Let us take a few examples. In Argentina a former ref in the highest division who stopped last season said that he had proof of a lot of teams bribing the refs. By paying them money before the game and even during half time in order to change the outcome of the game. And for those who say: “No, a ref cannot change the result of a game” or say “We should be stronger and then the ref cannot do us anything,” I think it is time to try and let this sink a bit deeper in your brains. Because tell me if it didn’t work why would those teams give extra money to the refs in order to change the result? And when this former ref came out in the open with his findings he also said that River Plate didn’t pay what they promised to the refs and that as a result they were heading for trouble. And trouble they are heading for because for the first time in their history they have been relegated to the second division in Argentina. And even serious news agencies have reported that River Plate has been the victims of a lot of referee mistakes this season. So it does look that the refs had a role to play in this. Just like the former ref said would happen. Oh well this is Argentina you might say. Let’s go a bit closer to home. Let us go to Greece. Where there also have been some arrests lately where games have been sold by some clubs. And also in this case refs have been named and (if my information is correct) have been arrested. Some 64 people have been arrested in total. Oh this is Greece some might say. Well let us go to Germany where players have been bought and where ref Hoyzer admitted that he had arranged games. He was paid by gambling syndicates and was send to prison for this. And now we have a scandal in Hungary. Seven persons have been arrested in Budapest a few days ago. 3 former players amongst them. But also 4 refs that still were active at the moment they were arrested. And to make things worse those refs were Fifa refs. Those Fifa refs are being arrested for match fixing commissioned by again a criminal gang from the far east. Being a Fifa ref is the highest category you can reach as a ref. You could say that participating on a world cup is the highest thing for a player, becoming a Fifa ref is also the highest thing to reach as a ref. This is the category where Webb and Dean are for the moment. And yet their colleagues who have reached the same high level in refereeing have been bought to change the result of games. In total the criminal gang has been trying to buy 6 games and in 4 of them with success. Games in Finland, Hungary, and even some countries in South America. And 3 of those 4 refs also had been suspended by Fifa after some strange international friendly games. Estonia-Bulgaria (2-2) and Bolivia-Latvia (2-1) where all the goals came as the result of a penalty. So you have Fifa refs doing such things. And as I said Fifa refs are very well treated by Fifa and Uefa. Doing international games is something that is very well rewarded financially by Uefa/Fifa. It gives you a lot of extra money and you get the best travelling arrangements, the best hotels, the best food. All you can think of and all you can wish for. And like I said you get good money for doing such games. And still refs are willing to risk their status for even more money. They even risk to be send to jail for more money. Human greed is a strange thing. So there are plenty of examples of refs who are being bought if you want to know about it. Some will still close their eyes and say it will not happen here. And yes it could well be that English refs are not greedy. Maybe they are immune to money. Maybe for some genetically reason they cannot be bribed. This would be great. But when you think of Newcastle-Arsenal you wonder…are we really immune? Are you absolutely 100% sure those things are impossible in England? If you do, I sure hope that Santa Claus will bring you a lot of presents this winter. My sock stays empty unless my wife and children put something in it. But telling you a lot is wrong is one thing. Proposing how this can be prevented is another thing. Because refs are human being and we all have our dark sides. We all make mistakes. But if we really want to do something about it, we should make it almost impossible to let it happen. But in order to reach this state it will need a total rethinking of the game. We will have to bring in people who watch the refs on the spot. Like in many other sports is used we will have to use video technology to help the refs to make the correct decisions. We will have to have a video ref who can look at the crucial decisions like goals and penalties to see if something was wrong or to confirm it all was correct. This will not be easy to do at first. But if we don’t do something about it, things could become worse. The more money involved the more money that could be given to refs (or players) in order to arrange some things. It happened in the past, it happens now and it will happen in the future. Unless Fifa is willing to do something about it. Will they do such a thing? Are Fifa, an organisation that itself is famous for their corruption, act to keep our sport clean? Or will they brush it under the carpet and let the bad guys ruin the game until we all turn our head disgusted by the wrong things we notice? Remove the crooks from the game. Remove the incompetents from the game. We will be watching you and we will report it when we hear and see some things going wrong. And as long as Fifa is not making this happening we over here at Untold will just do our best to keep an eye on what the refs do. Not for the benefit of Arsenal. But for the benefit of football in general. How the Anti-Arsenal Arsenal came into being in 2000 Untold Arsenal. The story of the last time something odd went on. It will be naive on anyone’s part to say corruption does not happen among refs in England.It happens all over the world. Some people for some strange reason i will never understand do not want to belive it even after the Italian match fixing scandal.One reason for this could be that there seems to be no government watch on football administrations.The Italian match fixing scandal was only unearthed after proper police investigations.I am of the view that there should be regular investigations into the working of football administrations. looks like andre marriner should bee looking over his shoulder as this signature match fixing move cost us two points in the title race but strangely non of the big papers seem to want to touch this story but you could’nt blame them what with barca and united looking for good midfielders to put on their benches. great article u can mention threat to the refs also cauz am sure of it not only money force ref to go the wrong way. And check the world cup mistakes Fifa surely is corrupted ! Spot on and thanks Walter. Bent refs –like bent police, bent polititions and indeed all bent servants of the state should be in one team– the HMP FirstX1!! I even didn’t mention the mother of all ref corruption cases in Italy. Thanks for bringing this up. Kudos, Walter! So well put together, and understated at that. Yesterday, as I noted, Bladder and Platini are both cited as agreeing that video technology was not good for football. They cloak themselves in the sacredness of tradition while thereby opening the door wide to mayhem. And this after UEFA is reported to have flagged 41 matches! as “suspicious” and alerting the Greek FA to it. By then stating that video technology is not good for football, they are doing a “limited hangout” – trying to segregate and isolate the Greek contagion as a special case. This on the heels of the recent mess surrounding Bladders re-re-re-election and the charges and counter-charges of corruption against the organization from two of its (now “disgraced” insiders). It is a time of kleptocracy and I applaud you for sounding the alarm so well, again and again. It’s a time for fans to be proactive and press for serious reforms along the lines you suggest and more. Again, my favorite quote from the Bard: “So foul a sky clears not without a storm.” Is in not time to pre-empt the next Newcastle/Dowd fiasco in the forthcoming season with some forms of pressure/petitioning on behalf of video technology, etc., for at least one season. It would be refreshing to see that result, wherever the chips may fall. p.s. I also hope that you are considering a Dowd Watch if there’s time, or if someone with proper experience and credentials could/would take it on under UA’s umbrella. Sorry Walter but you know my stance on this topic. I do agree that there IS corruption in sport, regardless of where it is and what it presents since where there is big money to be ¨earned¨, the criminals will be involved. In Football there are many ways to have a game ¨thrown¨ than relying on a referee to award a dodgy penalty or expel a key player such as; bribing the keeper to drop a few clangers (every keeper has dodgy moments in every game), paying a striker to ¨miss¨ a key penalty or open goal (they do this often enough without being bribed, paying a manager to keep a needed substitute on the bench, paying a player to commit a red card offense, etc. I also regret having to repeat my unchanging dictum that ¨a person is innocent until proven guilty beyond a reasonable doubt.¨ Perhaps the creation of an independent, non-governmental body of investigators who are NOT associated with Football but are willing to investigate questionable behaviours of clubs,players, managers and officials is overdue. This Ethics Board would have the authority to access bank and tax returns, utilize the constabulary services to undertake an in-depth investigation (including videotaping,wiretapping and sting operations)and report(in camera) behaviours to the proper authorities (the magistrates, government, FA, EUA and FIFA) using their statistical, financial and investigative findings as proof. Until this strategy is followed, any accusations or spoken presumptions of guilt or public suspicions of malfeasance are unjust, unfair,undemocratic and highly dangerous. They can encourage the corrupt to disguise their evil deeds and hide any proof that might be present. If it is organized crime involved (99% of the time it is)then they will melt away like the vermin they are or worse still, arrange for any witnesses to suddenly lose their voices, once alerted by these accusations. Once again Walter, I support your call for there to be a general review and Inquiry of all Football dealings in the EPL and perhaps the entire FA by an objective body, in order to substantiate persistent rumours and suspicious of dishonesty among its community. I think one way to deal with is this is to have refs assigned to games without knowing what role they will play (lines, fourth, or field). The roles would only be assigned randomly right before the game. I would also like to see two refs on the field and of course video replay. I think refs need to be graded by an independent body after each game to weed out incompetent ones. Clearly we need professional refs who are paid well to reduce the temptation. took the cake was the WBA vs ManUre last season.You did an article on this regarding a certain Nigerian foward and I did comment then.When I tried to read the further comments later on ,I found the post to have been taken out .I’d wanted to asked what happened but assumed that some “pressure” had been put on Tony.So come on Tony-spill the beans ,did they make you an offer you could not refuse ? well in over 5 matches this year the ref has been the difference bewteene 1 and 3 points for Arsenal. (liverpool and sunderland where Arsh got a goal wrognly disallowed springs to mind). That is 10 points alone. the margins are small, you dont have to do alot to make this happen. But Arsenal has not been the club most screwed over this year. The smaller clubs in PL suffers most. And unlike ARsenal which commands some interest from the press, the WBAs and the Birminghams of the world nobody cares about. I bet they dont even have a Walter or a Tony to tell the world about their injustice even. They just have to suffer it. I think that Tony might have considered the possibility of litigation for defamation of character a real let down for for this site, and we also need to consider just who is organising the corruption arsenal seem to be at the wrong end of. it is a dangerous position to hold as untold would be on a hiding to nothing, so prudent rather than cowardly, i volunteer! Basically, Arsenal has to be 10-20% better than other teams to win the Premier League. It makes you really appreciate how good the team was in 2001/2 and 2003/4. Brickfield – no one has ever demanded a post be taken off this site and had it happen, nor have I been threatened with legal action. So I am not sure what happened with the WBA / Man U issue. I will look into it. It was one of Walter’s articles Tony – I think the general impression was that it could be unfair on the player (although there were no direct accusations) and Walter pulled it. I thought it was an excellent article. I remember that WBA/ Man U article written a while back and thought it was quite poor. I am glad it was removed. @ Brickfields Gunner, what was the point you wanted to make about the Nigerian forward? No one can indict anyone, but can – with evidence like Walter’s End of Season report and Newcastle/Arse analysis, repeat analysis, qualify to have brought reasonable doubt to the suggestion that there is nothing awry to certain referee performances. Reasonable doubt, yes, in the court of law is needed to protect a defendant. But reasonable doubt – based on analysis – that certain a certain referee performance is NOT down to a bad day, mere coincidence, human error, the butler did it is FAIR – when based on analysis – in the courtroom of public opinion. The case being made at UA for something likely bent in some cases has decidedly not been tabloid swill. Moreover, I find your not-related-to-football Ethics Board highly problematic. Who are they accountable to? Who would appoint them? What football expertise would it demonstrably have (when you say not connected to football, please clarify)? And the blanket ability to investigate anything with no restraint is downright undemocratic. In fact, it’s a totalitarian suggestion in service to ethical football; which I do not find a strong enough reasons to toss away privacy protections in the rest of social life (as you seem willing to countenance). So, when you say, until we have an Ethics Board that any “suspicions of malfeasance are unjust, unfair,undemocratic and highly dangerous,” I find your Ethics Board to be “undemocratic and highly dangerous.” I would prefer that fair-minded people make and win their arguments in the light of day in the marketplace of ideas and somehow muster enough energy to even publicly petition for the necessary reforms to ensure fair play and a level pitch. Yes the only one responsible for removing that article was me. After hearing other people (and a person who knows a few things about such things)and as some pointed at the risk we could be facing legal action I removed it. This Untold writing is supposed to be fun for me. I don’t want to be lying awake in my bed thinking: Oh my god will the police stand at my door tomorrow morning. 😉 And as I felt uncomfortable about the article I felt it better to remove it. This pretty much sums up Arsenal’s situation. The referee is now head of the PGMO. How can a man that made those decisions be deemed fit to be in charge of anything let alone the top referees in this country? Unless, of course, there is something that stinks. @ Andy Kelly I remember that match. Watching the video got the emotions going again, this time round because that is how most teams – not just Man U are allowed to play against us nowadays. Howard Webb has really filled in where Mike Dean left off. It would be great if pressure was applied and Webb next season did not officate any ‘big’ matches at Old Trafford. p.s. short of an Ethics Board, would you be for against a league-wide petition with fans’ pressuring for video technology? other reforms? Or, must an Ethics Board first be in place that clinches an iron-clad case showing malfeasance as a foundation for THEN bringing about video reviews and the like? My concern is that by saying only and when there’s an Ethics Board, then there is no scintilla of action that anyone could take to bring about a scintilla of reform. To me, there is truth in the cliche that the perfect (the ethics board as you’ve described it) is the enemy of the good (an imperfect but practical reform). @Domhuaille MacMathghamhna: my posting above (the p.s.) is to your attention, cheers. I am absolutely seething now. How familiar it has become by this point. If people go on and on about our ‘mental strength’ and then compare it with the Invincibles, this should also show them that talent, and mental strength still will not be enough to win the match or the league if such things happen. It was less at the time, at least noticeably so. I say our team has huge mental strengths. Time to be 15 points better than the rest now so we can clinch the title with the last kick..If that makes any sense. Mike Riley will do all he can to stop Arsenal like he did in 2004. This man should have been banned from football after his disgraceful performance that day. He got rewarded for it! And this man is the head of the refs and hold power over the refs. So one wonders how it is possible for a Dowd to do what he did and stay a ref? No, he will get his reward one of these days. We will see him acting in some responsible function in the future. The total whorishness of Riley and the play-pretend thankfulness of van Nistelroy after that blatant gift of a penalty shot, Rooney’s cold as ice cynicism, Rio’s robotic distancing from the mayhem to which he feels entitled, and Lord (to be) Ferguson gleeful prancing around like a deserving child there, on the sidelines, as the ManUre pit gurgles over with swill. My god, that spectacle is Exhibit A as people here are noting. This video has had over 126,000 viewings (you tube’s number there on display). A UA video about last season’s calls/non-calls – even just the comparable Newcastle/Arse travesty or Birmingham crime scene – will also have the power to stir moral outrage and perhaps pressure for reforms. This video and one from last season bear witness. They are a lasting stunning indictment of business as usual; one that should put paid to the self-righteous charges of no evidence by many here at UA, and to the self-proclaimed helpful devil’s advocacy of another. I hope, Walter, that you and yours would/are still considering some kind of video testimony to last season’s ref-shite; as this glaring aspect of our problems is being drowned out in the continuing agonies over last month’s collapse. Lastly, Andy Kelly, I found it amazing how one of the TV commentators says, after a vicious un-penalized take-down by ManUre, that well, a TV replay would have shown this, but the ref’s don’t have that luxury. Even the pro-Manure commentary acknowledges – in mid stream – then and there – that video replay would have given (at least) a yellow card for the contact that Riley “missed.” In the land of the willfully blind, the one-eyed replay camera is king. Without it, we are Guaranteed the Rednose 20th. To me, the only question left for the betting man (syndicated, of course) will then become, will he be anointed “Lord” Fergus before or after he lifts the cup he so well deserves, as the media will assure us. Sorry for the migraine; but thank you again Andy Kelly, a true service your link. Oh in some cases it isn’t even players ‘leaving’. It is ‘left’. Cheers, Shard! Great stuff you offer on their destabilization game (campaign?) Yes, it’s “self-reinforcing” as you say! ; each so-called story (sorry, statement of FACT) incestuously feeds off the other. Perhaps they’ll reach from 10 to 20 links, one link for each of Manure’s utterly remarkable record of achievement. Let’s keep front-and-center this awareness: as the Guardian recently reported, that two MPs have now just begun the push to “his” (we need not even name “him” to understand what the media now mean by this word [wink, wink]) candidacy for the House of Lords. Surely it will only be down to Coincidence that “his” elevation is announced straight after he lifts his cup. Maybe they will rename the cup in his everlasting honor, amen. Perhaps Riley will be given the honor of handing it to him, on bended knee, before kissing the ring. Then again, if they are really feeling their oats, his elevation will occur before the final match of the season. Indeed, why postpone the party? Shard, methinks the proverbial handwriting is on the wall. Media-watching can at least hold up the mirror (not The Mirror, ahem) so that it all unfolds in plain sight. Some prefer it all eyes wide shut. But if/when fans finally care enough, there will then be pressure for reform. Thanks to UA for an oasis where truth-seeking is alive and well. Back to THE VIDEO: after giving up The Penalty Shot, and van Nistelroy’s primal-screaming, I now truly see why mad Jens went mad. I was in a pub a few seasons ago, me as the one Arsenal man in that pile of ManUre, and suddenly was pointing madly at the TV screen — when, lo and behold, Rooney pulled off yet another blatant high dive that went uncarded. The pub went silent as I screamed “there it is! diver! diver!” Those people just sat there watching the screen with a few condescending smiles on a few mugs creased with the smug entitlement. No one even bothered to squash this cockroach that had shown up at their dinner table. Experiencing, for the first time, that unblinking sense of entitlement to getting the bent call really struck me. Then your VIDEO shows it as a MASS phenomenon: in the face of blatant theft, that stadium rises on its back haunches and roars its delight as if nothing untoward had happened. This will bore people who by now are well used to this behavior; but I really find it as scary as it is dishonest. They are Exhibit A, showing how (misbegotten) power corrupts absolutely – players, fans and The One (aka the manager). And here’s another thing about that Man Utd game. Yep, Arsenal got more bookings than Man Utd! Paul Taylor is a Tottenham fan. What the report failed to mention was that the FA received a letter from an Arsenal fan informing them that after making the accusations against Wenger he left a number of voicemail messages on his ex-girlfriend’s mobile phone boasting that “he had done Wenger”. He did this as he know that his ex-girlfriend’s brother was an Arsenal season ticket holder. Taylor had to back down after he was shown the letter. Thankfully he only ever refereed one Arsenal game (Southampton away in the last game of 2000-01). Imagine what he could have done if he hadn’t been so boastful. Cheers for this one, again from the memory hole. Did the FA get the letter during the hearing period or after the hearing period. The article didn’t say, and wow! this is forgotten history I guess. 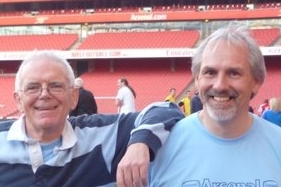 Would you guess that Paul Taylor was put up to setting up Arsene in advance; or just that as a Tiny-totts man he had his unexpected opportunity in the tunnel and went for it? It’s really great, in any case, for me to find out the untold stories that, alas, are all too relevant. Cheers, Andy. @All: It would be fun and eye-opening to read each other’s sage responses to this one. It will keep open our Pandora’s box and be a litmus test for what counts (or not) for us as “evidence” for what’s bent. I’d label the lesson: “The Evidence of Things Unseen.” How about it DP, Domhuaille, countryboy, Tommy Gun, Walter… Bring it on! Cheers to all. I usually never watch the other games in full and almost always keep switching channels ( we get 2-4 EPL games on at the same time),but that particular game really pissed me off and I was screaming at the tv. This is another example on how important it is that refs declair their support and dislikes to any team at the start of their career as a ref. If the FA would have known that Taylor was a tottenham fan they could have kept him away from Arsenal. But yeah… would the PGMOL do such things with Riley in charge?? @ Brickfields Gunners, I understand you now. I thought you were saying that if a player was having a bad game it was because he was being bribed. @ Walter, it was Riley wasn’t it! I get the two Mikes mixed up. Indeed Finsbury – another one!